We lucked out with a bonus Thursday in March which means *you* get another week to participate in Color Challenge 66! Remember, you don't have to have the EXACT colors to play - just use colors inspired by the ones you see below. This challenge features an inviting quartet to inspire your next project — Safety Orange, Cranberry Cocktail, Tropical Teal, and Tangy Orange. 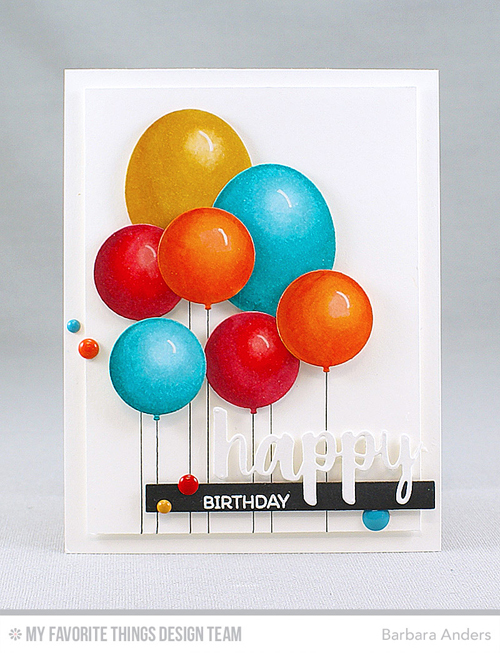 Barbara's balloons, created with the Balloon STAX Die-namics, look so realistic you're convinced they're about to float right off the top of her card. Her masterful coloring, layering, and simple pen-drawn balloon strings are so effective at creating a festive scene. Vika incorporated those fiery colors into her look using the Wild Greenery Die-namics. She brought the teal in using her sentiment block and a sprinkle of accent elements to create her sophisticated look. Be sure to give Color Challenge 66 a go yourself - there's still plenty of time to play along and we always love to see all of the ways you're inspired by the challenge! Really love MFT. but 2 things I can't find out is 1) when does this challange finish? (Do you normally put an end date on your challanges) and 2) can we enter them here in the UK?